This classic medical symbol Caduceus is handcast and hand-finished in solid American Pewter and adorned with Genuine Swarovski Crystal. Blue Topaz is the crystal birthstone for December and the Zodiac signs Sagittarius and Capricorn when they fall within the month. The Caduceus is on an 18" leather cord with a lobster clasp and 2" extension chain, or you can request one of our additional necklace options. 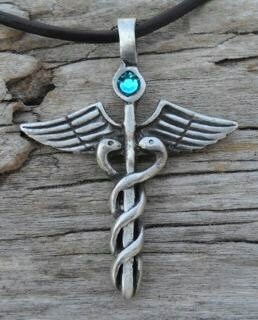 Length including loop: 1 7/8"
The Caduceus is the legendary herald's wand of the Greek God Hermes. This symbol, a winged staff entwined by two serpents, is nearly universal, found in Egypt, Mesopotamia, and India, where it is always a symbol of harmony and balance. The symbol may have originally been a symbol of the sovereignty of the Goddess Tanit. In the Hermetic Tradition, the Caduceus is a symbol of spiritual awakening, and has been likened to the Kundalini serpents of Hindu mysticism. 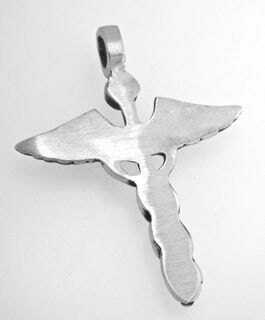 The Caduceus is often used as a symbol for medicine or doctors, in place of the Rod of Asclepius which is the usual symbol of the medical profession. Early confusion between the symbols almost certainly arose due to the links between alchemy and Hermes, whose symbol is the Caduceus. By the end of the 16th century, alchemy became widely associated with medicine in some areas, leading to some use of the Caduceus as a Medical symbol.